Randy Hlavac is a college educator at Northwestern University, author, digital marketing forum creator, speaker, and digital strategy consultant. Social Media Marketing Specialization – is one of the world’s largest social marketing programs and his training programs have helped entrepreneurs and established companies build digital programs to impact customer satisfaction and to position them as influencers to grow market share. Want to execute your digital marketing programs in-house, build your professional persona or position your brand? Randy Hlavac has custom-tailored training program tailored to your companies exact business needs. 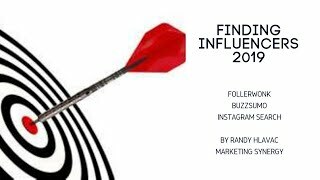 Randy Hlavac is an author on digital marketing and also recommends the best books, articles, vlogs, & podcasts to keep you connected to the trends impacting your business today and tomorrow. View new books & new curated content. We are creating a new digital marketing forum which we will launch in early 2019. Until then, please join over 25,000 digital marketers, entrepreneurs and digital analytics experts on Twitter or LinkedIn. Both feature some of the best thought leaders in a wide range of business and marketing topics. If you want to see some of my digital marketing videos, go to my YouTube channel. Great free content on digital strategies, social analytics and testing. Finally, keep current on trends in digital marketing, analytics, privacy and other issues by signing up for my bi-weekly digital marketing blog.